In 1519 there was the first mention of an organist at St Margaret Pattens but his name is not known. “Itm paied to the organ player for his wage for a yere XVIJs.Vid” Not a large sum of money, even allowing for the change in the value of money. In 1521 there is mention of an organist called Mawridefylde, but the entry in the record book is rather unintelligible, for he seems to have paid the parish in connection with the instrument. “Item recd of Mawridefylde for lackyng oute lady day in Lent at the organs VIIId”. One possible explanation is that he being responsible for the organ on the Feast of the Annunciation, he failed to turn up and was, therefore, fined. For his quarter’s playing he was paid 2s 6d. A mention is made of a predecessor namely Thomas Johnson who was paid 5s 0d for his playing in the Michaelmas quarter. For a time the “player at organs” was shown as a specific cost in the accounts and it would appear that Mawridefylde was Johnson’s deputy who wore a “suyrplysse” the making of which cost 7d. The next recorded organist appears to have been Thomas Griffin the “provider” rather than the builder of the 1750 organ. In 1806 Robert Glen was elected organist. “He married the daughter of Mr (Samuel) Wesley (a nephew of John Wesley), the musician who introduced Bach’s music to the notice of Englishmen”. The late Dr Percy Scholes (in the Oxford Companion to Music) says that Samuel Wesley “was a friend of Mendelssohn, and like him (and before him) a great champion of Bach in the days when that composers outstanding genius was only here and there admitted”. “Mr Wesley’s name appears in the register as witness to his daughter’s marriage, with that of his other daughter Miss Eliza Wesley. During the later part of his life she acted for him at St Margaret’s and at his death was elected to succeed him and held the office until Easter 1888.” So the post of organist was held by two members of the same family for 82 years. Although Eliza Wesley is recorded as having held office until 1888, Horace Buttery apparently assumed the duties of organist and Director of Music in 1885. It is on record that Eliza Wesley received a pension for a number of years which the Charity Commissioners “ruthlessly cut off” in 1891. She died in 1895. It would appear that during Miss Wesley’s tenure of office there were other organists presumably acting as deputies for the names of F C Bevan, William Wait (1879-1881), a Mr Hughes, Walter Stark and T Drew. Horace Buttery, the organist and Director of Music appointed in 1885 is recoded as an artist by profession, but was also an accomplished musician and choir trainer. Mr Wait was re-appointed in 1893 and is recorded as having raised the choir to a very high standard. There the occurs a gap in the records until 1940, but for some years before 1940 there were no Sunday services and it would follow that perhaps there were no regular organists during this period. From 1940 until 1946 Miss T M Bullock, a daughter of the then Rector of St Peter-upon-Cornhill was organist and in November of that year Raymond Gray was appointed, holding office until August 1948. From then until May 1950, Charles Barnes was organist, then KW Pitman assumed the office of organist and was in post until May 1990. The current organist and Director of Music, Rupert Perkins, took on the role in April 1997 and has built up a strong choral tradition with a regular choir including city office workers. 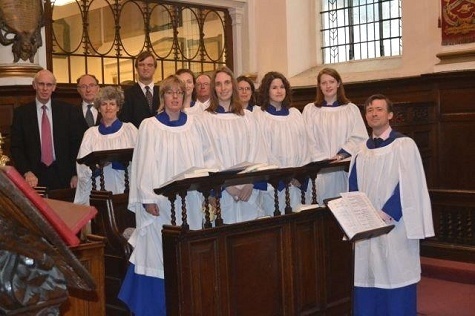 They provide choral music for the monthly lunchtime choral communion service, as well as performing for livery events, evensongs and concerts. Their repertoire is extensive and challenging and ranges from renaissance to modern.